I haven’t posted anything about our budget in many months. I was still conscientiously keeping track of our daily expenses in a notebook, but had fallen behind in entering them into Budget Your Trip. I also didn’t want to post our average daily budget until after we sold Berenjenita, so that we could figure out how much the money got from the sale offset our original car-buying-and-building-out costs. 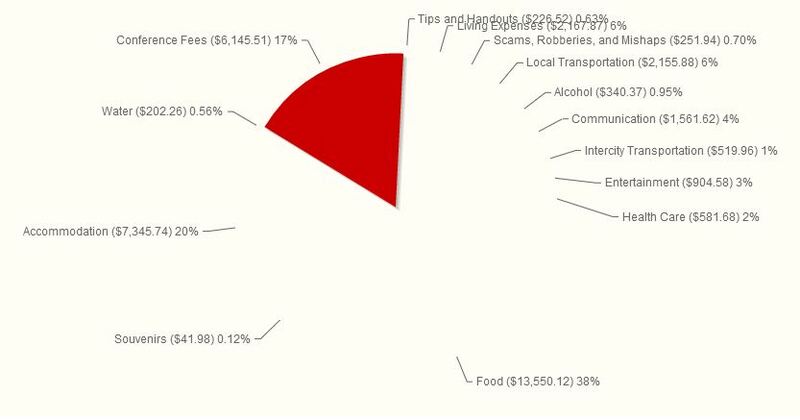 There was something wonky with the pie chart function on Budget Your Trip, so the chart doesn’t show all the pie pieces, but you can still see the percentage of budget each category takes. “Conference fees” are all the costs related to travelling in the van: gas, repairs, supplies, tolls, etc. 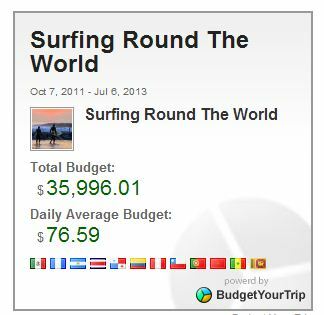 We’re quite a bit over our budget of $60 a day for both of us, not including plane tickets. Why so much? Food is by far our biggest expense. We just can’t help sampling the good stuff! For example, although Portugal was very cheap for us, we realized after the fact that all the cheap goodies in the markets, such as cheeses, wines, and endless varieties of chocolates, had tempted us to eat without checking if we were staying on budget. Not to mention the restaurant trips. We were like kids let loose in a candy store. We never would have been able to make wood-fired pizza or grilled seafood as tasty at home as at those restaurants, so we’re not feeling guilty :). However, there is a lesson in this: if a country is cheap for travellers and has lots of tempting things to offer at lower costs than you’re used to, it’s still easy to go overboard and think all the little splurges won’t add up to much; track your expenses even more closely than usual every day in those places! Despite recouping a lot of our van build-out costs in the sale to a fellow traveller in Peru, we went over our budget in Peru and Chile due to gas costs, as well as the major repairs. We wanted to take advantage of having wheels, and Chile and Peru are both such vast countries in terms of length, so we never ended up staying very long in one place over the seven months we were there. The longest times we spent in one place were a few weeks in Lima, when we were buying and building out the van; two weeks in Pichilemu, Chile; and two weeks in Chicama, Peru. We don’t regret buying the van and driving around so much, either. We had some of our most memorable experiences during that chapter of our trip. It still surprises us when we remind ourselves that buying a van was a spur-of-the-moment change of plans for us. We can’t imagine what our travels through Peru and Chile would have been like without Berenjenita. Lesson here: during the planning stages, leave some room in your budget for spontaneous changes to your trip. You won’t regret the extra money spent in exchange for the freedom and flexibility. Biggest lesson learned: noting daily expenses is important, but what’s most important is regularly looking at the expenses as a whole to see if you’re on track, and adjusting course if necessary. We were a little worried when we saw that we were over our budget $16.59 per day. However, due to our lengthy overland stay in South America, we’re way under our airfare budget, so we may still break even in the end. All of our costs in Sri Lanka are very low (it’s the cheapest country we’ve been to so far) but we’re only here for another couple of weeks. We’re hoping to be able to stay below budget for three months in Indonesia as well, but still have yet to see how much moving around we’ll do there. Then it will be on to New Zealand, Fiji and Hawaii – all very expensive places! I am the snow leopard. I walk in silence. I see but am not seen. I am the snow leopard.